Use the Search box. In the upper-left corner of Game Alley is a Search text box. To search for a specific game, enter the title or part of the title and click the Find It button. If you want to find a particular user, first click the Users radio button above the search box and then type the name of the user you want to find. The results show everyone whose name or mechanic bio contains the search term. If the Find It button is unresponsive, reload the page. Click one of the Categories buttons. You will find five white Categories buttons in the left sidebar that link to subsections of Game Alley. If you’re looking for practice in Game Alley, always check the Featured and Top Rated categories, though all games are useful for practice. 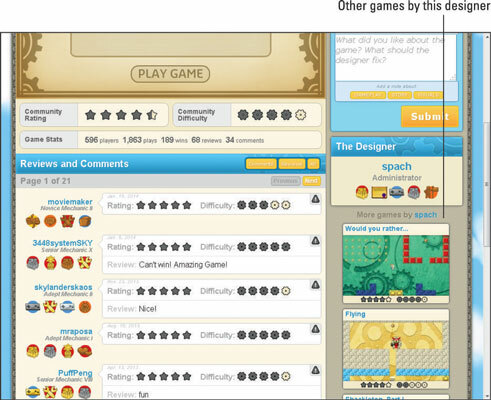 Featured games are selected by the administrators as examples of good experiences, and Top Rated games are very popular among other users. You can also find games directly from game pages. If a user publishes a game you like, try seeing what else that person has worked on. When you’re playing a game, a random selection of five other games by the same user is displayed in the lower-right corner for you to try. Alternatively, click the creator’s username (on the right side of the screen, under the title of the game or in the box titled The Designer) to see that person’s workshop. Then you can see the user’s Showcase game, a list of the user’s games, and a number of the user’s favorite games that the user thinks you might enjoy. If you find a game you like, add it to your Favorites list. (Click the heart-shaped button in the upper-right corner of the page for the game.) The game is stored in your workshop so that you can play it again later — and recommend it to others who view your workshop.